Heritage Place does great taking care of my dad. They assist him with daily duties like feeding, dressing, grooming, bathing, and medication dispensing. My dad is not happy with the food all the time. There's always something going on for the residents. For us, the price is reasonable. Thank you for your review. We are happy to be caring for your loved one. Heritage Place is nice and close to my doctor's office. They serve three meals a day. If I go there, I'll have my own private room. The price is right, but I can't afford it right now. I ate there once before, and they have pretty good meals. I also like that I can bring my own car and park it at the back of the building. They have all the activities and amenities, like an indoor theater, and you can take the bus to your doctor's office or shopping or wherever. I had a very nice visit at Heritage Place. Things seemed to be in order. It was nice, clean, and neat. I did not smell anything. The dining area looked very nice. My mom is in Heritage Place. We chose it because her sister has been there, and she knows all about it. The staff has been very nice to her. They are very good. The rooms and the dining area are very nice. Momma says the food is good. The have activities like a dance where they bring in a band and they have the residents involved in that. They play bingo. They have bible study. They have wheel of fortune. They just have a lot of different activities, and they have it posted where she can pick what she wants to do. The neighborhood is good. There are several purchases right around it. My mom likes it there, and I recommend it. Heritage Place was really nice, but at that time, they didn't have a single available for my father. It was a little bit older, but it looked like a very good place. The staff seemed very confident and very nice. We went to Heritage Place for my mother. It was way out of her price range. We were not made aware of their amenities because they were having a birthday party for a lady that had just turned 100. The facility was a darker atmosphere; it wasn't really light and spacious looking. The facility was pretty, but it just wasn't bright and cheery like the other facility. It is a high rise building. The rooms weren't really bright or light. My grandmother is in Heritage Place. The staff was very friendly. The rooms are very nice and spacious. The food is very good, and my grandmother is very happy with it. The dining room is very clean. They have a lot of games. They have activities listed on the elevator that they change every day for the residents to be able to see. They have exercise groups, bingo, and wheel of fortune. They go out to grocery shops and things like that. This is the independent living. So, they have a lot more freedom and are able to do more because of the type of care. It has independent living and assisted living. My grandmother qualifies for independent living. The place is very secure. They always have someone at the front desk. You have to sign in and sign out. What impresses me most is the way they have it set up, and they offer everything that my grandmother needs. I chose Heritage Place for my aunt because of what they have to offer, the payment plan is easy, and she knows people in there. They have the care that my aunt needs. It is perfect. We're not that far, it is only 5 miles away. The staff is very good. They do well with others that need assistance and they do well with others that don't. They know their residents very well. The rooms are very nice and very comfortable. We're thrilled. The menu is very good. They have lots of exercise. They have something for everyone. My aunt is very pleased. I would recommend this facility. My mother-in-law was in Heritage Place for about 11 months before she died. It was an excellent place, but it cost every time she had to stay there. They had apartments that they could live in, and a nurse would come by and check on them. Her caregiver was good. When she needed someone, there was always someone there. Then she was in the total care part, where she couldn't keep her own medicine. She was in bed so that she could not get up by herself. She would ring a bell, and it notified the nurse when she got up so that they would know to come and help her. We would go in at different times, and she was never dirty; she was always clean. They were very patient with her and with her pills. They were very good to her there. They worked with the family. My sister-in-law had control mostly of the decisions about her care, and they cooperated with my sister-in-law with everything. I have nothing but good things to say about them. If I had to make a decision, I would definitely feel comfortable with Heritage Place. I was very impressed with Heritage Place. Everything was great, but they were all in their 80s and 90s. There were no 55 or 60-year-old people, and I need to be where there are active people. There was nothing wrong with the facility. They had some very good activities for people. The care was there, and the people were clean. The facility was very clean even though it's an older facility. I just would not feel comfortable being with senior people. They would take them out to places that they want to go to like Wal-Mart, the drug store, and on tours. They had church services, different activities, bingo club, and card club. Thank you for your positive feedback. When you are ready please visit us again. We would love to have you be a part of our Heritage Place Family. Heritage Place was the one I looked at and would probably go to if I decide to do that. It's convenient, it has all the amenities that I was looking for, and the prices are pretty good. They have a restaurant and the capability to go shopping, so you're not isolated. I've known people there and I've been to their quarters. I have seen how they serve people and I know how the restaurant is run. The staff has always been good. The facility is well constructed and well designed for what it is. Mr. Frank, Thank you for your positive feedback. I'm glad you had a great visit. If and when you decide to move we would love to have you be a part of our Heritage Place Family. We're in the process of moving into Heritage Place. The staff and the people are very friendly. The food is great. The rooms are nice and relatively new. They remodeled them to keep them that way. They have a variety of options from studios up to 2-bedroom, 2-baths. We have two rooms. My husband is in a handicapped studio and I am in a 1-bedroom. They have a lot of activities. They have a bus to take you shopping and to appointments. They have a small gym with free machines. The big thing for me is that it is right next door to my church, so I don't need a car to get to church. We are pleased to have you as part of our Heritage family. Can't wait for you to get settled in. My mother is at Heritage Place now. Her room is very nice, very clean, spacious, and we are very pleased. The staff is very nice, very pleasant, and very accommodating. I’ve actually eaten there a couple of times with my mother, and the food is really good. Heritage Place had very nice facilities. They did have the assisted, but I was familiar with the independent living where you had your own room. They prepared your meals, so it was like you were on your own, but they also looked after you. It’s very clean. Describe the overall population of assisted living residents at Heritage Place. What is their average age? What are their favorite things to do? The overall population of residents in AL is a mixture of male and female. The average age of our AL residents is 85. The residents love to play bingo, listen to live entertainment, participate in sing-a-longs, participate in crafts and daily exercise groups. What programs or activities does Heritage Place offer to enrich residents' well-being? Heritage Place offers a wide variety of activities ranging from religious services, guest speakers, outings, performances, exercise programs, board games, and special events. What places are near Heritage Place or within walking distance for assisted living residents to enjoy? Heritage Place is located in the heart of Fayetteville's Downtown Historic District, just a short stroll to local shops, eateries, museums, City Hall, and the local theater. What transportation services does Heritage Place offer to assisted living residents? Heritage Place offers transportation for medical appointments, outings, shopping trips, errand runs, and church services. What makes the chef or dining program at Heritage Place exceptional? What kind of menu can assisted living residents expect? The chef at Heritage Place has been here for 25 years. 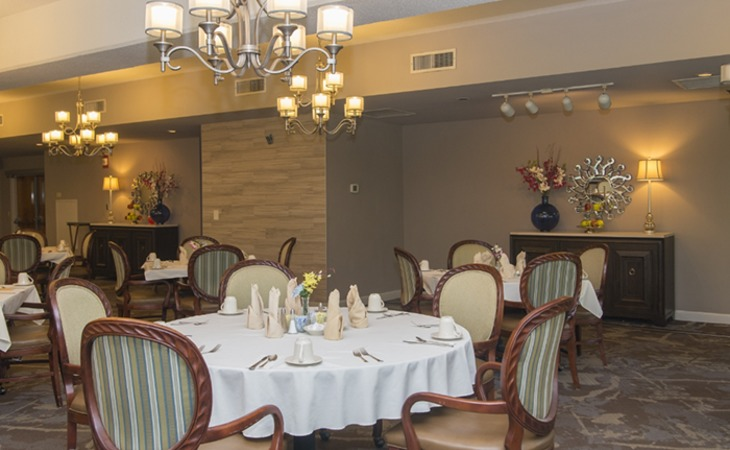 The residents enjoy fine dining with all their meals and get choices for entrees and vegetables. What safety features or security measures does Heritage Place offer to assisted living residents? Heritage Place has a security system and door code entry. The building has a sprinkler system and the fire alarm is tide into the local fire department. There is also a back up generator for the building in case of a power outage. All residents get a PHB (personal help button) at time of move in. This allows them to page for help when needed no matter where they are at in the building. How does Heritage Place keep residents' families informed about their loved ones? Heritage Place staff contacts family members if there is an emergency or if something is out of the norm. What is the care staff-to-resident ratio at Heritage Place during daytime and nighttime hours? The staff to resident ratio is 1:10 during daytime hours and 1:12 during nighttime hours. Training for AL staff is held monthly. Staff also has to complete training on-line monthly. Describe the overall population of independent living residents at Heritage Place. What is their average age? What are their favorite things to do? The overall population of residents in IL is a mixture of male and female. The average age of our IL residents is 85. The residents love to play bingo, listen to live entertainment, participate in sing-a-longs, participate in crafts and daily exercise groups. What are some recent off-site events that the community activity director at Heritage Place has organized? Heritage Place residents have been to the local theater for plays, went on a Cape Fear River tour, went on a Casino cruise, and other day outings for shopping. What transportation services does Heritage Place offer to independent living residents? What makes the chef or dining program at Heritage Place exceptional? What kind of menu can independent living residents expect? Every floor has a different common area for residents to enjoy. There is a library, exercise room, theater, area for church services, sun room, and several patios for all residents to enjoy socializing. What safety features or security measures does Heritage Place offer to independent living residents? Heritage Place has a security system. The building has a sprinkler system and the fire alarm is tide into the local fire department. There is also a back up generator for the building in case of a power outage. All residents get a PHB (personal help button) at time of move in. This allows them to page for help when needed no matter where they are at in the building. If Heritage Place accepts dogs or cats, what indoor/outdoor areas can they enjoy? Residents in IL are allowed to have a small dog or a cat as long as they can take care of them themselves. Residents are allowed to walk their dogs anywhere on the property as long as they are on a leash. Does Heritage Place work with an agency or registry to provide nursing and medical assistance as needed? Residents in IL can have outside agencies to assist them with their daily needs. Heritage Place works with several local agencies and can assist residents with this process. Southern charm, friendships and a carefree lifestyle abound at Heritage Place. Nestled in the heart of Fayetteville’s Downtown Historic District, you and your fellow residents are just steps from the Cape Fear Botanical Garden, centuries-old cathedrals, and convenient shops and services. At Heritage Place, you can choose from a number of beautiful residence options, all filled with companionship, fellowship and life. Come and enjoy everything you’d want in a home in our warm and caring community. What can you expect from a Somerby managed community? It means that we ensure a high level of associate engagement with our residents and foster a community culture and environment that is conducive to healthy living. Our innovative approach to spiritual and physical wellness is rich in opportunities for lifelong learning and an everyday experience that is Full of Life. Life at Heritage Place is a pleasurable blend of beauty, historic charm, and southern hospitality. Heritage Place is located in the heart of Fayetteville’s Downtown Historic District, just a short stroll from the Cape Fear Botanical Garden and centuries-old cathedrals. What should caregivers and potential residents know about Heritage Place?